Photograph courtesy of the MABEL team. Caption by Kate Ramsayer and Adam Voiland, with information from Kelly Brunt. From above, Arctic ice looks quite different in summer than it does in winter. A sheen of white covers most surfaces in winter due to snowfall and frigid weather. 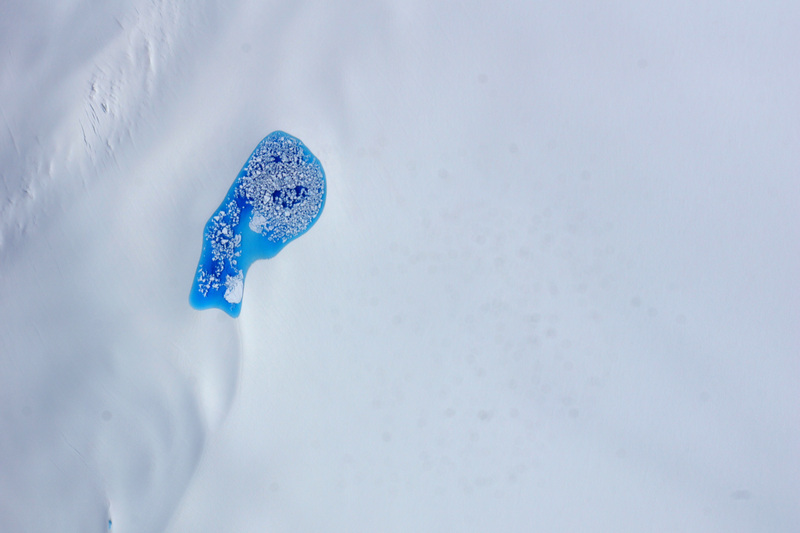 As temperatures rise in the summer, turquoise splotches of color begin to speckle the ice surfaces. When it took this photograph, the ER-2—a civilian version of the Air Force’s U2-S reconnaissance plane—was flying at 64,000 feet (20,000 meters), about twice as high as a commercial jet. In addition to the camera, the ER-2 was carrying the Multiple Altimeter Beam Experimental Lidar. MABEL is a laser altimeter designed to measure the elevation of glaciers, mountains, forests, and other landforms below. Scientists are using MABEL’s measurements to design algorithms for the upcoming Ice, Cloud and land Elevation Satellite-2 (ICESat-2) mission. MABEL is similar to an instrument that will fly on ICESat-2, and scientists can use its measurements now to better understand how the instrument works and what the data will look like when they start making measurements from space. The 2014 MABEL campaign was launched, in part, to study melt ponds and other features of summer ice. Engineers added a new camera system that made it possible to match the MABEL measurements with a photographic glimpse of the ground. The digital camera took a picture every 3 seconds, with each frame capturing an area about 2.5 by 1.5 kilometers (1.6 by 0.9 miles). 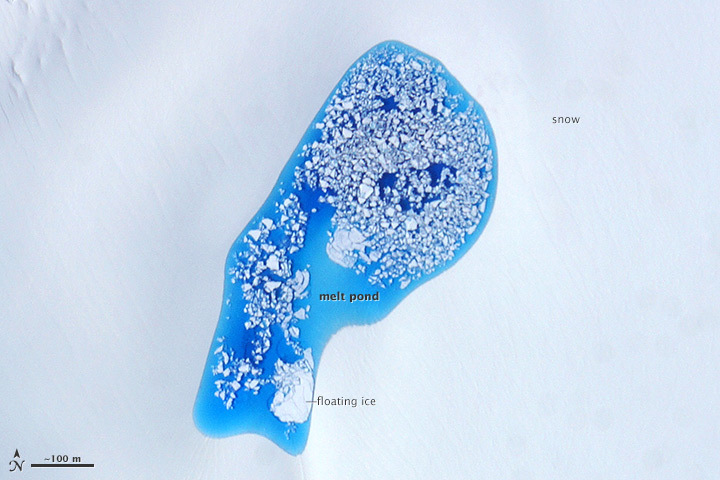 Many questions remain about the impact of melt ponds on the extent of Arctic ice melt. Water absorbs much more heat from the Sun than ice and snow, so when a pool of liquid water forms on top of ice, it changes the heat balance. The water warms up in the sunlight and can speed the melting of surrounding ice, possibly influencing the Arctic Ocean’s sea ice extent. “The melt pond coverage may be an indicator of the ice cover at the end of the summer,” said Ron Kwok, a senior research scientist at NASA’s Jet Propulsion Laboratory. To find out more about the MABEL campaign, please read this story. To find out what it’s like to suit up and fly the ER-2 in try this blog post. BBC (2014, June 16) Ponds ‘predict Arctic sea-ice melt.’ Accessed July 31, 2014. NASA (2014, July 11) NASA’s High-Flying Laser Altimeter to Check Out Summer Sea Ice and More. Accessed July 31, 2014. NASA Earth Observatory (2014, July 28) A Pilot’s Life at 65,000 Feet over Alaska. Accessed July 31, 2014. NASA Earth Observatory (2014, July 28) A Tour of the Top of the World. Accessed July 31, 2014. NASA Earth Observatory (2014, July 28) MABEL and the ER-2 Take Flight. Accessed July 31, 2014.